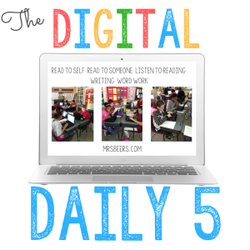 ​The Digital Daily 5, an outstanding guide as to how to improve students literacy through the use of Technology. Mrs. Erin Beers uses the Daily 5 in her sixth grade classroom continually. The Daily 5, which oddly only contains four practices, consists of word work, writing, reading to others, and reading to self. Mrs. Beers typically does some kind of game or activity at the beginning of class in order to strengthen the vocabulary of her students, as it is their weak point. Next, she wishes to achieve writing proficiency through exercises such as having the students participate in writing activities that make them react and think about various situations which require interpretation. Read aloud's are done with a partner and typically, the children are paired with someone with the same fluency as them. Reading to themselves require them to be accountable for their own education as Mrs. Beers allows the children to read whatever they desire, with certain limitations of course. The Digital Daily 5 is a way to take the normal daily five one step further. ​Why use Digital Assignments, according to Mrs. Beers? Digital resources are paperless, but can be printed. Students work directly in a given file. Technology is integrated into instruction. Students are highly engaged in their work. -The students are able to use digital programs to build their vocabulary. Things like word of the day programs or applications can intensely advance a students vocabulary, achieving the first goal of the Daily 5. -Also, by integrating technology into the Daily 5, students have access to many materials and texts when completing their task of reading to themselves. Also, the teacher has the option to limit or expand what exactly the students are reading. Students are now able to comprehend the world around them as they dive into news stories and explore ideas that are new to them. -These students are not only benefitting from what they are reading from a literacy standpoint, but it also helps them develop ideas and explore them in their writing. Through this online exploration, students become more articulate and well developed all around. The technology also allows student writing to be more organized and allows the teacher to assign journal entries which can be due digitally or on paper, giving the teacher more options. -It is also a nice change of pace for the students as far as listening to others read. There are many digital audiobooks that can be accessed through educational technology. By listening to others read the story and following along, it allows for reinforcement of tone and theme as the narrator properly conveys it in their ears. My final impression on Mrs. Beers blog are extremely positive. Mrs. Beers has introduced new ideas that any subject, however particularly language arts based, can use these kinds of educational technology resources in a classroom. She is very thorough in her belief in the Daily 5 and makes it a point to set goals that are to be achieved day in and day out.